Insert the third disc of the DVD set and from the Main Menu go to the 'Extras' section. There, highlight the menu entry 'Setup' and then press the 'Right' arrow key on your remote control. This will highlight the zig-zagging lifeline on the screen. Now press the 'Enter' key and you will see the Seinfeld cast discuss the 1994 Northridge Earthquake. Now insert the fourth disc of the DVD set and from the Main Menu go to the 'Setup' section. Highlight the menu entry 'subtitles' here and then press the 'Left' arrow key on your remote control. This will highlight the heart symbol and if you press the 'Enter' key now you will get to observe a suggested camera angle of the ugly baby. Go the "The Pie" episode menu. Highlight "Play Episode" and press the left button. This should highlight the TV Listings. 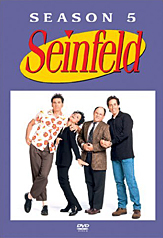 Press enter and you will see a short clip of Jerry's manager George Shapiro filming a scene in that episode that did not make the final cut.